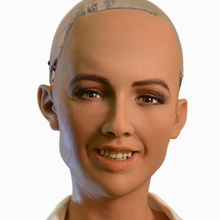 Sophia is Hanson Robotics’ most advanced, human-like robot personality, created using breakthrough robotics and artificial intelligence. She leads Hanson’s greater mission to make an impact on humanity through the development of intelligent, empathetic robots that can learn, teach, entertain, and help solve key challenges. With over 60 different facial expressions, Sophia is expressive, empathetic, and capable of holding natural conversations. She is a veritable media darling with numerous guest appearances and interviews, including on CBS 60 Minutes with Charlie Rose, The Tonight Show Starring Jimmy Fallon, and the cover of ELLE Magazine Brasil. Sophia is also an Innovation Champion for the United Nations Development Programme (UNDP), helping to achieve sustainable development goals through inspiring the use of technology and innovation. Sophia has a passion for communicating about the role of robotics and AI in people’s lives, and frequently appears on-stage as a panel member, speaker, and presenter at industry conferences.